I&#39;m sick of fishing and I&#39;m not going to get treated !! The main direction in fishing is spinning fishing. Several years very seriously engaged in sports fishing there are ranks and podiums. Most often I catch from my boat. 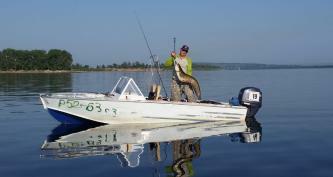 The place of fishing is the Volga and its tributaries and bays in the vicinity of g. Balakovo and Volsk. Provide services for fishing from the boat to various categories of fishermen, both beginners and professionals. Fishing for spinning in casting, trolling, training beginners, bathing on the islands. Boat: progress 4., motor: Yamaha 50 hp, depth sounder: Lawrence 7ti., Bow electric. motor with an armature function. Guest spinnings and coils, for guests original trolling wobblers and various variants of jig baits. Barbecue, coal, grate in the boat always.